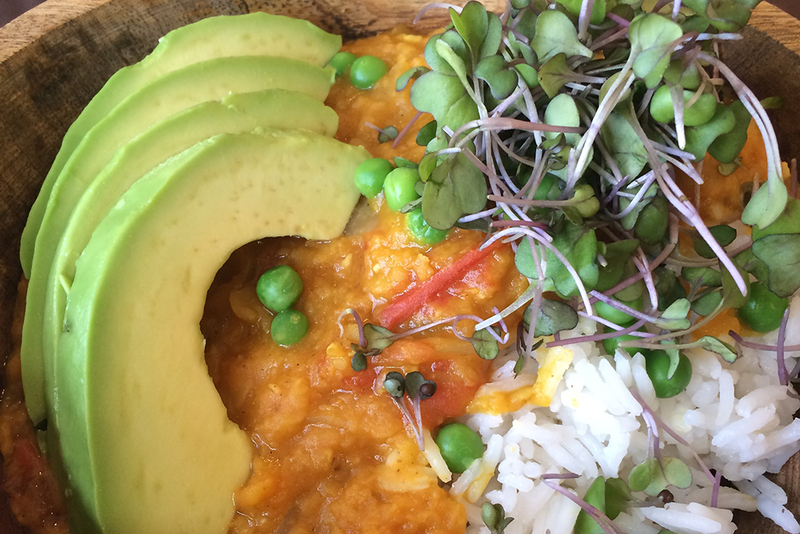 I love all vegetarian recipes but this dhal recipe is one of my favorite. It is a quick and easy dinner. I like to serve it with basmati rice and garnish it with slivered almonds and avocado, fresh tomatoes and sprouts or green peas and pumpkin seeds. If you like indian flavours, cury and spices you’ll love lentil dal. Rinse 1 cup red lentils. Place in a saucepan, add 2 1/2 cups water, Bring to a boil, then reduce heat, cover and simmer 12 minutes. Set aside. Place a saucepan on the heat and pour 2 tablespoons of olive oil, add the onions and cook until soft, about 5 minutes. Add 1/2 cup water and cook for another 5 minutes. Add cumin seeds, curry powder, turmeric, ground coriander, garlic, ginger, tomato paste, tomato, oil, salt, pepper and cook for 5 yo 10 minutes. Stir in the cooked lentils and serve. I’m very happy that you liked it ! I looooooove this recipe. So tasty! Also a big fan of the mexican dishes on your page. Going to try the tofu and noodels next. I want to try this, but need to know how many does this serve? Loved how simple the Dhal is for a quick dinner. I usually spend a large amount of time when making Dhal. I did add Bengali and chopped red chili pepper for spiciness to the onion and other spice mix. Turned out perfect! If I wanted to make it spicy, what would you recommend adding? I don’t have instincts for just tossing ingredients in, and I love a spicy dhal. I like this a lot, but why is there 3 mentions of oil in the ingredients, but the recipe only uses 2 tablespoons? Sooooooo good. I cook a lot of Indian dishes and I was very impressed!